Now that you know how to come up with endless ideas for blog post content, let's look at a number of different ways that your content can be shaped into information your readers will find both useful and entertaining. Teach your readers how to do something or reach a goal, either by writing an article or creating a video. The majority of posts on this blog are how-to tutorials and they are also the most popular. As an affiliate marketer, product reviews are ‘bread and butter' posts that link directly to your merchants' sites and products. You can review a single product or do a comparison of two more products. These posts can be referred to from almost any other type of post on your blog. Tag those posts with either ‘product review‘ or ‘review', so they can be found easily within your tag cloud. Everyone loves list posts — readers and writers alike. THIS post is a list. They tend to be easier to write, read and understand, as the list points are brief but comprehensive. Every so often I stumble across an issue with my blog or business that needs to be resolved. Knowing that my readers may face the same or a similar situation, I often write a blog post about both the problem and the resolution. Here is an example – Plugin and Broken Links Could Kill Your Affiliate Business. I have a category devoted specifically to warn affiliate and internet marketers about scams and other troubles associated with doing business online. While ‘problems' with your niche may not be your favorite topic, your readers will applaud your efforts to keep them advised of trouble they may face. They'll also appreciate your honesty which helps to build trust in a big way. A simple post that offers answers to readers' questions about everything and anything, without having to be related to a specific blog post topic, is always much appreciated. Set yourself and/or your readers a challenge, i.e. post to your blog every day for a month. At the end of the month you can write another post about your experience and ask your readers' to share theirs. Everyone can use regular injections of inspiration and motivation to keep working at their pursuits. You can write about your own experience, relate someone else's motivational methods or create a list of helpful books. Show your readers who you really are. Tell them about a day in your life, your perspective on a particular event or how your dog helps with your blogging. 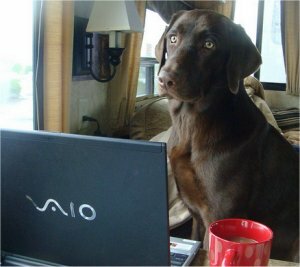 Yes, that is my blogging dog, Jasper. He has his own Facebook page too! Has something exciting just happened within your industry? Quickly post a brief news article with your readers and link to the article where you first learned of the news. There are dozens of blogging, affiliate marketing and Internet marketing conferences throughout the year. I maintain a current post of those events, linked to from my sidebar. What types of events are held within your niche? Help your audience save money on the products and services you promote by letting them know when your affiliated merchants have a sale or a new coupon available. Offering free stuff can be even better than sales and coupons when your merchants know how to convert those customers. For example, Chemistry.com frequently offers ‘free communication weekends' which I post on my dating site. Those free trials often end up in sales. Contests are an excellent way to engage your current readers and increase your subscriber numbers at the same time. For example, I held the Lightbulb Joke Contest: Win a Copy of “Insider Secrets To Marketing Your Business On The Internet”. By asking readers to respond with a comment on the post, you also enjoy the benefit of additional content which you didn't need to create! When the contest closes, be sure to revise your post accordingly. Surveying and polling your readers is both fun and informative. After you've accumulated a respectable amount of data, you can then blog about the results. A glossary of terms related to your niche is super simple to create. Make sure to include a link to your glossary alongside your FAQ and other essential posts on your blog. This blog has a glossary of Internet Marketing Terms. Checklists are composed of tasks necessary to reach a goal. On this blog, you'll find the “148-Point Affiliate Marketer / Blogger Checklist“. If you've been working / blogging in a particular industry for any amount of time, you will know what questions your readers ask most often. Create a list of those questions and answers (a FAQ), add to it when necessary and make sure that a link to that post is included somewhere in your sidebar or footer. I use the (now out-dated) FAQ-Tastic plugin to create the FAQ on this blog, but your FAQ can be a simple Q and A list. Holidays are a wonderful time to send greetings and a wonderful opportunity to express how enormously grateful you are to your readers. Almost anything you write about can also be turned into video or audio that can be posted to your blog. Posting videos to YouTube may help drive traffic back to your blog when you include your URL within the video description. 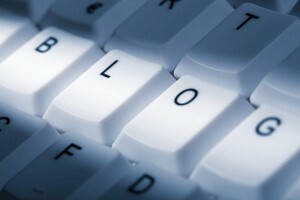 So, what type of blog post will you write next? Love this post – it is a wealth of great ideas! Thanks Ros! You’re welcome, Jaime. My pleasure! Glad you enjoyed it, Colin. I quite like the pose a challenge idea. Have you done it? if so how did it go? This is a great Post Roz. I’m often wondering about things to write. This will be a guide hanging on the wall! Awesome, Sandy. Hope you include Jasper’s picture in that wall-hanging. LOL! oh my ! so many types of blog post . Your info is good , I do apreciate all the informartion you are sharing with us.